Please check out Becky’s site for a great recipe and tips. I roasted my chickpeas using Becky’s guidance. I found a spicy recipe in an old Bon Appétit (October 2010). They turned out perfect. Drain and rinse chickpeas. Place on a clean kitchen towel and let dry. Once dry, use the kitchen towel to “rub off” the outer skin. This will ensure your roasted chickpeas are crunchy. You can see some of the skins that were rubbed off. Toast cumin seeds and coriander seeds in small skillet over medium heat until beginning to brown, about 2 minutes. Cool. Transfer to spice mill; process until finely ground. Place chickpeas, olive oil, pinch of cayenne, and ground spices in medium bowl. Sprinkle with coarse salt; toss to coat evenly. Transfer to small rimmed baking sheet. Roast in oven until lightly browned and crunchy, stirring occasionally, about 35 minutes. Let stand at room temperature. Now for the soup. A while back I posted a Pumpkin-Tomato Soup with Chickpeas and I mentioned that I thought the basic recipe would make a good creamed soup on its own. Here is what I came up with on a recent snow day at home. Cook garlic in oil in a large, heavy saucepan over moderate heat, stirring frequently, until golden, about 1 minute. Add pumpkin puree, broth, beans, tomatoes, and sage. Bring to boil and then reduce to simmer. Simmer 20 minutes. Remove from heat and puree with an immersion blender. Season with salt and pepper to taste. Serve with a garnish of roasted chickpea croutons. Yes, this soup has pumpkin in it as well. If you have pumpkin-haters in the family, simply don’t tell them. If you have bean-haters in the family, call this a Tomato-Pumpkin Soup. If you have bean and pumpkin haters in the family, just tell them it’s a tomato soup. I am all about subterfuge if it helps your family eat healthier. There is no need for cream in this soup. The beans and pumpkin gives it a silky consistency. 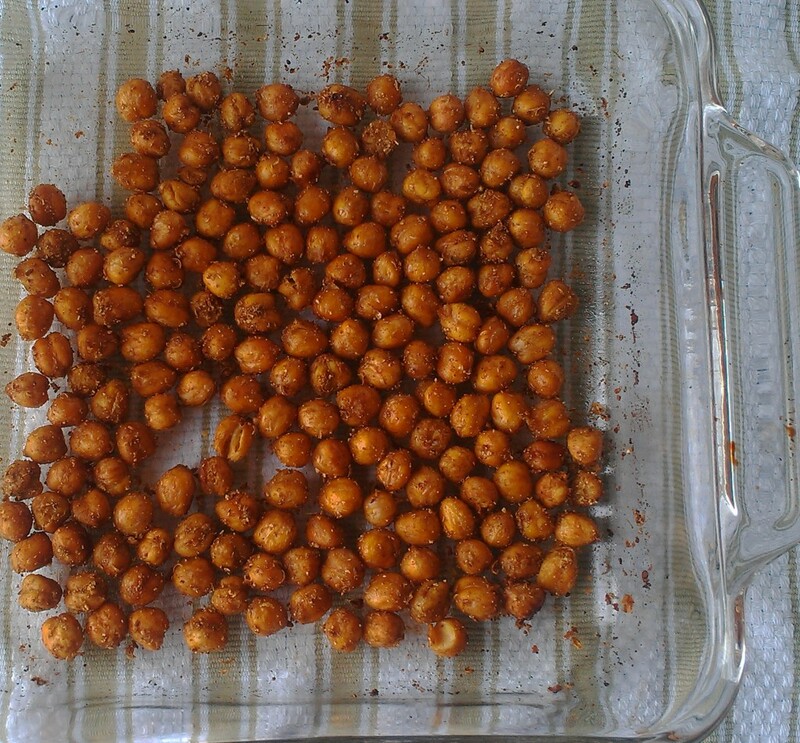 I have roasted chickpeas and they turned out pretty good. I did dry them but didn’t know about the shelling part. And what a great idea to drop them into soup! Love it. I love the idea of chickpea croutons and what a delicious combination of flavors you’ve got going on with these! Chris, we love this soup! 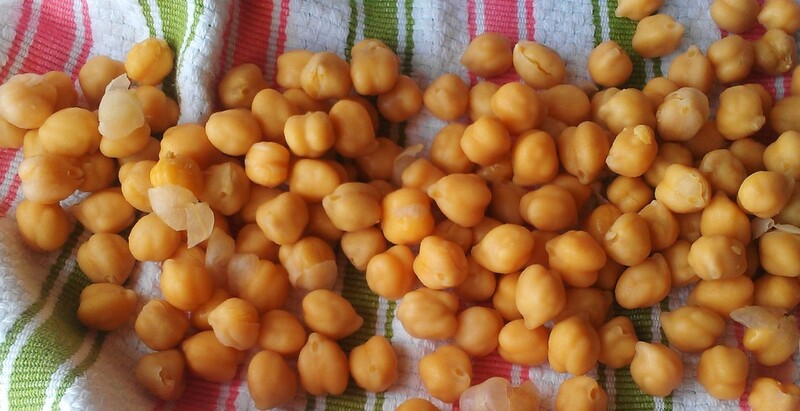 I love chickpeas…simply boiled or roasted…they are just too delicious! 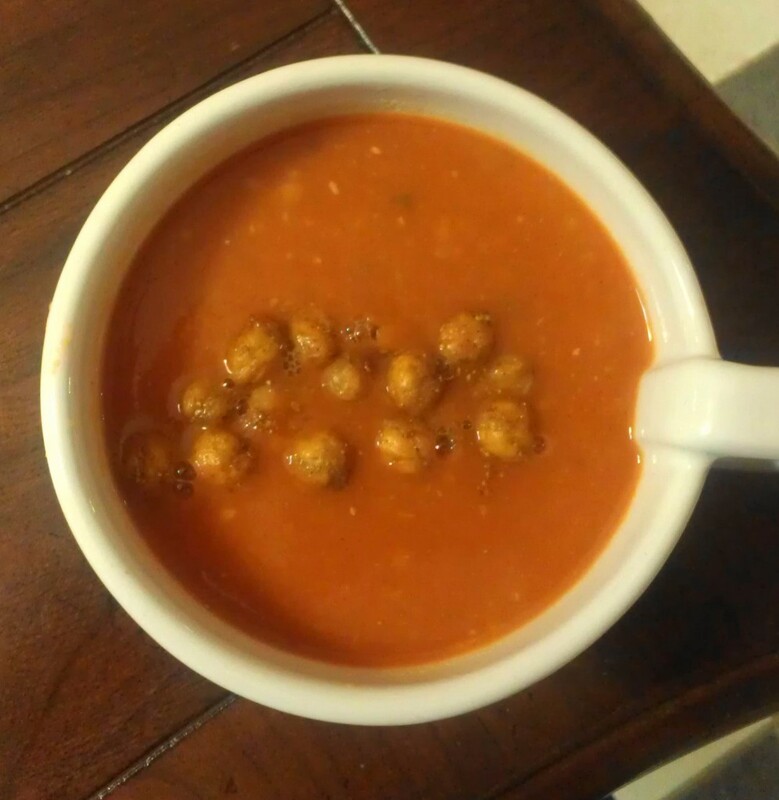 The soup looks awesome with chickpea croutons, Debra. Thanks, Angie. Happy Monday (and St. Paddy’s Day)! I knew to dry the chickpeas but not to shell them first–I’ll have to try it. My favorite part of soup is usually the different toppings and I love the idea of the roasted chickpeas as croutons. Yum! Thanks, Deb. You can play around with all the flavors of the roasted chickpeas to complement the sop flavors. Glad to hear someone else had problems with roasting chickpeas. So completely dry and skinless is the trick. Maybe I’ll try them again. Yours do look perfect! Love them with that soup. Great first go with the SRC! I think this would be a great bowl of soup! I never thought of it but now that you mention the tomato and chick peas it sounds great!